Two Asian carriers have taken delivery of their first Airbus A320neos. Airbus A320-271 B-8545 (c/n 6975) was handed over to China Southern Airlines from the manufacturer’s Hamburg/Finkenwerder facility on December 14. It was followed two days later by B-8637 (c/n 7129). The jets, which have been leased from AerCap, are the first of 24 examples the SkyTeam carrier has on order. All Nippon Airways became the first Japanese carrier to take delivery of an A320neo when it received JA211A (c/n 7401) on December 16. The aircraft features Pratt & Whitney PurePower PW1100G-JM engines and is configured in a two-class layout with eight Business Class seats and 138 in Economy. The carrier will start scheduled regional services with the aircraft in January. In a triple celebration, Boeing has delivered the 500th 787 Dreamliner to roll off its production lines. The aircraft, F-HRBA (c/n 38769), is also the first 787-9 for Air France and the 50th example for Netherlands-based lessor AerCap. The Air France-KLM Group has ordered a total of 18 787-9s and seven -10s, with an additional 12 -9s being leased through AerCap, which holds the world’s largest orderbook for the type with 83 examples either in service or on order (22 -8s and 61 -9s). 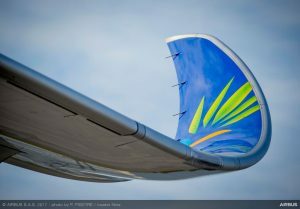 The aircraft arrived at Paris/Charles de Gaulle on December 2 and will undergo crew training , including four special “welcome flights” around the French capital on January 7 and 8, before entering scheduled service on the flag carrier’s Paris-Cairo route from January 9. Mexican carrier Volaris has received its maiden Airbus A320neo, making it the first North American airline to operate the latest generation jet. The aircraft, N528VL (c/n 7051), is one of ten A320neos Volaris is leasing via AerCap, along with six A321neos. The airline has 30 neos on order in total. Volaris’ A320neos are powered by Pratt & Whitney Pure Power PW1100-JM engines and are configured to seat up to 186 passengers with 18in-wide seats. Cathay Pacific Airways has become the sixth airline to take delivery of the Airbus A350 XWB. Its first aircraft, B-LRA (c/n 029), will be operated under a long-term lease agreement from the Dutch lessor AerCap. 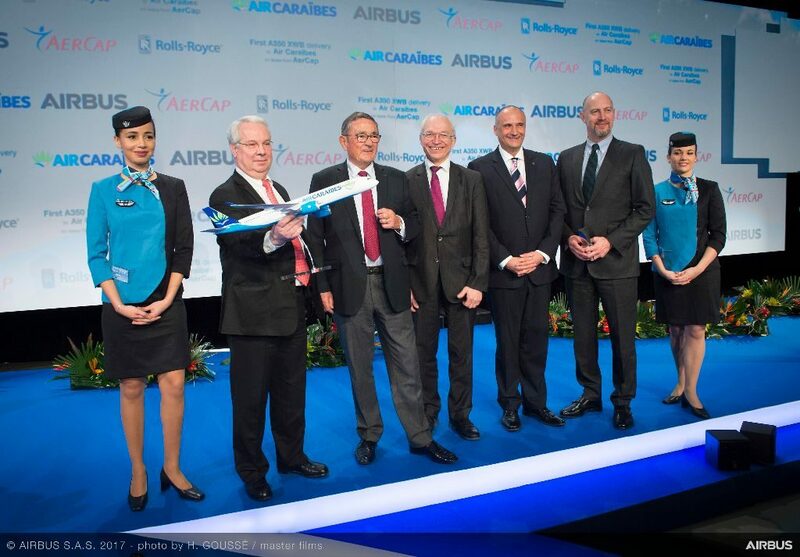 The jet, featuring the carrier’s new livery, was handed over during a ceremony at the manufacturer’s Toulouse facility on May 28. The Hong Kong-based airline has 48 A350 XWBs on order consisting of 22 A350-900s and 26 of the larger A350-1000s. The aircraft has been configured with a premium three-class layout, which can accommodate 280 passengers, comprising: 38 lie-flat seats in Business Class; 28 in Premium Economy and 214 in the main cabin. Cathay Pacific will be introducing the new aircraft initially on its regional network before starting long-haul operations later this year.